Just before I posted this. As of midnight, Thanksgiving Day, I’m right on target at 40044. I plan on writing in the evening when people can be in the region’s chat room. It’s becoming clear to me my story will go over 50K by a large margin before I can actually go through and start editing. It’s always this way, actually, which is partially the reason I haven’t actually published anything. I write so much stuff I know I’m going to have to cut and I run out of steam by December 1st. It’s a cycle I have to break if I’m going to be published. This year’s book has been more difficult because I have the first and third books sort of weighing on me. More things about my world are becoming clear–such as the source of conflict between the Hex and the Covenant. But I still haven’t defined the governmental policies, given proper names to the continents and countries, developed a timeline for my events–there’s so much that goes into world building. Since this particular story started with that still-developing world, one character, and her basic conflict, I’ve found myself skipping things I should do–like naming secondary characters! So, when I get as much finished as I can here, I plan on printing out all three books as they stand and trying to pull everything together. I’m told seeing it on the page makes a book a whole lot easier to work with! My current word count is right on track: 3494. The word count widget is in the right sidebar. Just to prove that I don’t write just female characters, let me introduce you to Alain di Wintersea, from my novel, Knights of the Hex. He is majii but has what many would consider a low-key power: he can turn one inorganic thing into another. He is the current head of the Wintersea clan, known for the long line of majes that the Maj (the world’s spirit) has chosen. A scholar and historian, he is considered a good overseer to his region and quite a handsome, virile catch, even in middle-age and after two marriages–one failed, the other ending with his wife’s death. He is in love with Elise and he inadvertently sets into motion some of the plot’s events when he sends his son, Denys, to a disputed island that has been lost to the family’s records. Well, NaNoWriMo 2016 has begun! And we started off with a bang! (Not literally, of course.) Day One and we had a write-in at the local Panera. Not too many showed up but at least one newbie discovered the charms of a word war. I was under the eight ball from the start; not only did I have to come up with a new prize tote (the original one smelled to high heaven courtesy of a few old glow bracelets) but I forgot to download my IRC client when I upgraded my Scrivener and Open Office. I hope taking the paper, rubber, and cloth items will allow them to air so I can use them later this month. The stuff that had been in the stinky tote still smelled strongly enough to me that I felt nauseous during the write-in. I sprayed the tote itself, a really cool antique-looking oval case with a leather handle, with too much Febreeze and put it out on the front porch to air. Current word count: 1774. You can find my official word count widget on my home page if you’ve a mind to follow my progress. Fortunately, I don’t have to spell well at the moment. I have the most horrendous typos! Also, you probably all think my only interesting characters are women. Well, that’s not true. I’ll post something about one of my male characters tomorrow. Now off to do a bit of research into some titles from my previous novels! 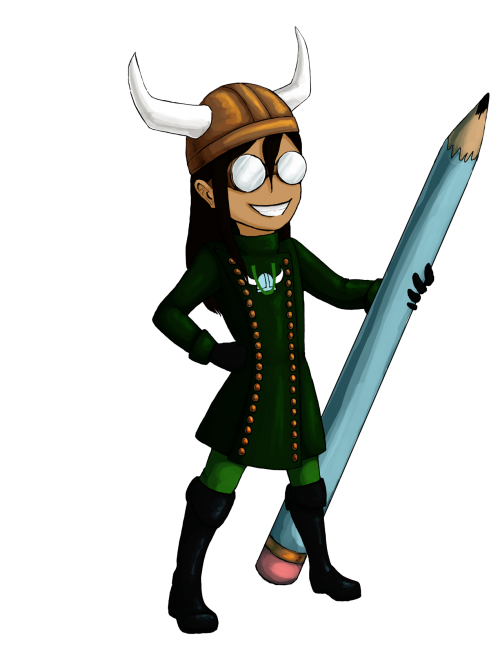 This particular character is from a middle-grade novel I wrote several years ago–the one NaNoWriMo novel I came closest to actually finishing. The story itself takes place in an alternate history, one where much of the Americas were still under colonial rule into the late 1800s and the sciences were just beginning to supersede magic in some areas. I liken it to a mixture of Harry Potter, X-Men, and the gaslamp fantasy Girl Genius with a soupçon of steampunk stirred in. I’ve been editing and rewriting to change the point-of-view from third-person omniscient to third-person limited. Siobhan is an orphaned girl from Eire, brought to New Anglia by her great-uncle, Father Liam O’Keefe, according to the terms of her grandmother’s will. She is a seer; she literally “sees” things from the past or future of those who touch her skin-to-skin. She also sees ghosts and spirits. Her grandmother enrolled her in a school for mages like herself where she is expected to learn how to control what she can do. At first, she is shy and unsure of herself. Her manners need work and it takes time for her to get into the routine of the household. But as she becomes accustomed to her surroundings, she learns of a plan to use her classmates for profit and insists on acting, even when those around her feel she is too young to help. Okay, these two are from my first book (third in the trilogy but first written). They are friends and traveling companions. Both are majii; Jen picks up on languages, both spoken and written, unusually fast, while Elise is considered “twice-favored” as she is both a healer and an empath. They are also of different kindreds. Jenestra is a dwarf (called dwermer in my story) and Elise is human. So, here’s a little bit from Knights of the Hex. Okay, I’ve said I’m a character-driven writer, so let me introduce you to one of them: Delphine di Wintersea. She’s the protagonist from Dawn of the Hex and starts out the story in her childhood. As a daughter of the house di Wintersea, she is a majii, gifted with powers from the Maj, Majere’s sentient spirit. (“Majii” means “the favored” in a long dead language of the world.) She is gifted as an auger–someone who dreams of future events–which is rather frightening if you’re only five or six. As a teen, she travels with her uncle Maslin to visit other majii he is acquainted with. It’s during one of these trips she discovers how her dreams are and have been coming true and spurs her to gather as many majii as she can find to form the Hex Majestorum, a guild for practicing majes. She hopes by working together they can defeat the strange beasts wreaking havoc on the other side of the Great Sands. Here’s a brief excerpt from Dawn of the Hex.